Easy is the kitchen for everyone. 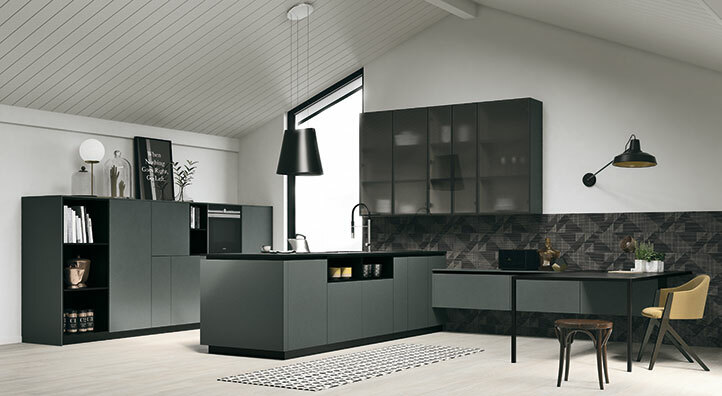 It is the ideal solution for those seeking an affordable quality modular kitchen. 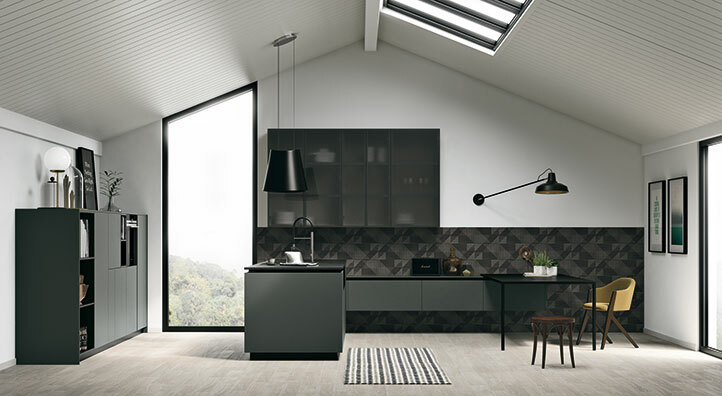 The vast selection of finishes, from polymers (glossy and matt colours or wood effect) to lacquers (glossy, matt, super matt and metal effect) to the most contemporary melamine finishes, allows for a variety of compositions with wall units and boiserie with LED illuminated shelving or tall wall cabinets that resemble mini kitchen cabinets. This kitchen features a sophisticated granite combined with dark super matt lacquer and inserted in modern atmosphere with a taste for all things dark. The working area with pantry, comprised of different sized modules and open shelving, is set between tall units and an island. 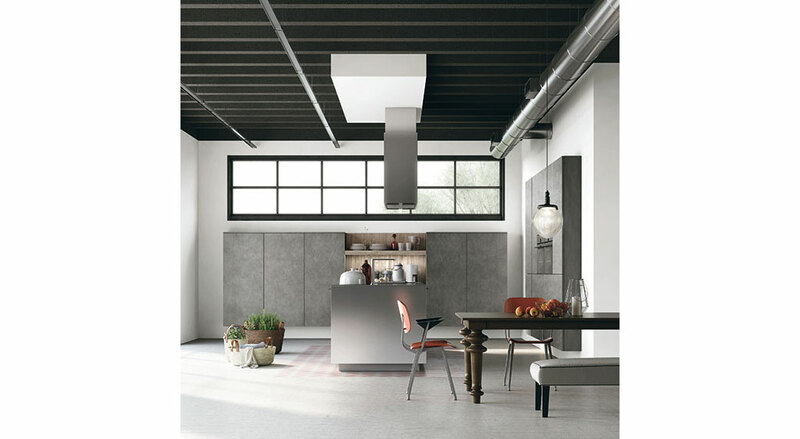 The kitchen is further enriched by open modules and a table that almost create a C shaped model. 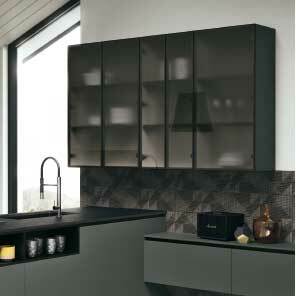 Wall units with frosted grey glass doors with black aluminium frame and internal LED lighting. 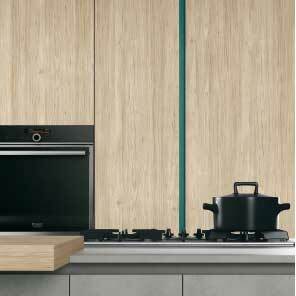 The practical groove profile of the base units continues as an elegant feature on the end side panels. The table is supported by the open shelving units. A narrow structure and surface in varnished metal. 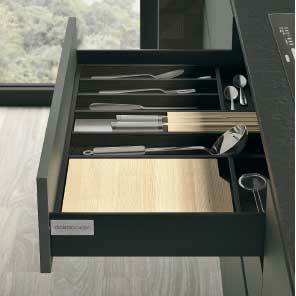 Drawer accessories for the kitchen include internal dividers, such as the elegant cutlery trays in natural wood and steel. 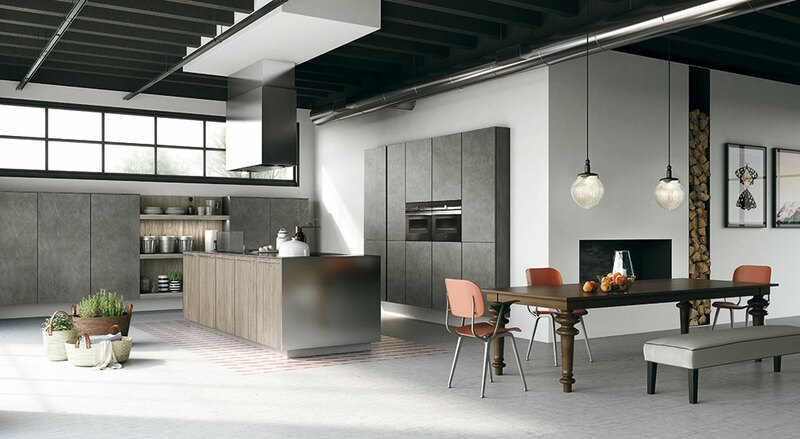 A modular kitchen makes it easy to furnish large spaces. A sophisticated combination joins the cleanliness of a candid white polymer, with a glowing glossy finish, and the aged effect of wood-look polymer with raised veining. The island model becomes a peninsula when the snack table is used as a connection. A kitchen in polymer doors is accessible to anyone, with easy-to-personalise finishes, colours that last over time and are easy to clean. The Cemento finish snack table stands out against the white base units. Joining the island to the wall run base units, you add a practical working area. 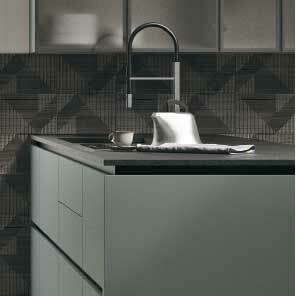 Easy is a quality modular kitchen that is easy to configure. 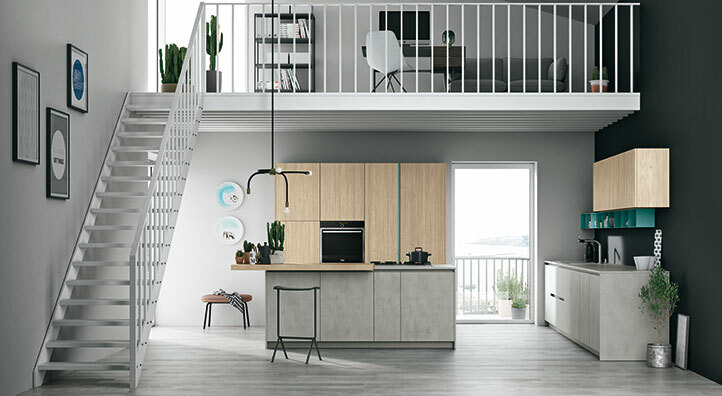 The solution that places the tall units with built-in oven and refrigeration zone behind the cooktop and to the side of the sinks creates an ideal triangulation for making it easy to work in the kitchen. Tall units with push-pull opening or matt lacquered groove profile in bright turquoise pastel. 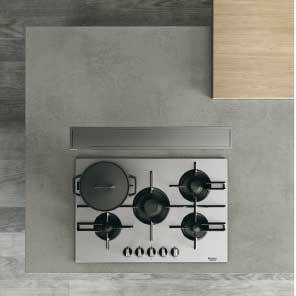 The island features a worktop in Cemento laminate, combined with the base units’ doors in Cemento Polvere melamine. 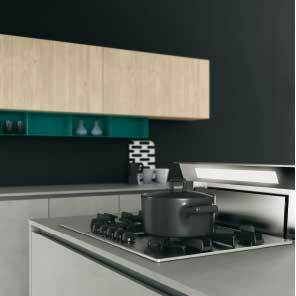 The Down Draft Hood is concealed in the worktop for a clean look near the cooktop.